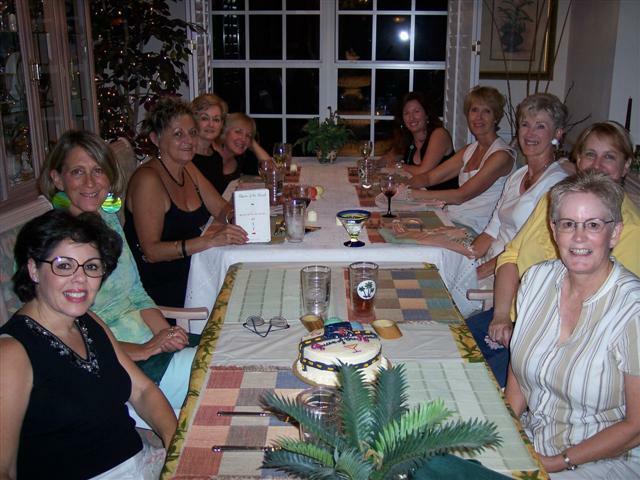 Starting on the left, going around the table: Nancy Siegal, Karyn Conrath, Sue Bankosky, (holding QUEEN OF THE ROAD, so she has a special place in my heart) Joyce Thornton, Tanya Oosterhous, Kristy Kiernan, Pat Kumicich, Betty Keigler. Terry Knight and Ellen Schmidt. Ellen is the one who initially contacted me about "appearing." I'm so glad she did. Not only was it a fun evening, but I made a new writer friend, Kristy Kiernan. Kristy is an amazingly talented novelist. For her first novel, Catching Genius, she was hailed by Sara Gruen (and what book club hasn't read her book? Oh, fine. Water For Elephants, people!) as a "writer to watch." Publisher's Weekly gave it a rave review. In addition to being a gifted novelist, Kristy is just a sweetheart. You'll have to take my word for the latter, but don't for the former: Her new novel, Matters of Faith, which just came out last week, has already been deemed an IndieNext Notable Title. Yeah, I know. What in the world does that mean? Well... it means that independent bookstores all over the country have weighed in and LOVE her book. My copy just arrived from Amazon - here's the link. I (and my book club) can't wait to read it. Now, about that cake. Sometime after Ellen contacted me, but before the actual group, Kristy had "friended" me on Facebook. The day before the book group met, I got notification of a Facebook "gift": Kristy had baked me a cake. OK. Yanno, she had seemed so, like, normal and all before that. I mean... yeah, I'm on Facebook, but it's kinda lame, in my opinion, to be "sending" people virtual "gifts." So, Kristy baked me a cake. Fine, Kristy... I've built you a city! Whatever. Then, during the group (which I attended by speakerphone), Kristy shouted out that everyone was enjoying my cake. Too bad I'm not licensed to prescribe in Florida. Whatever. 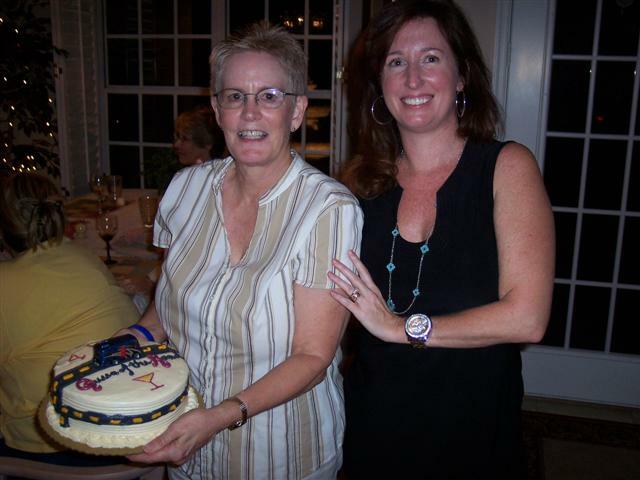 That's Ellen holding the cake, with Kristy standing justifiably proud of her creation. The book groups I've "attended" have been ultra-fabulous. It's wonderful to connect with women all over the country - and even make some online friends in the process. I'll be blogging about more of the groups, soon. For now, I'll just say that the Naples Divas Book Club may have spoiled me for other book groups. As for Kristy - she's an accomplished novelist, apparently fabulous baker and even writes a fashion column. I think I hate her. what?! if i get published people will willingly, freely, of their own volition, bake me cake?! We all had such a fun evening and enjoyed your comments. Keep writing! We had a great time, Doreen! And I think that was my one baking episode of the year ;-) Though when Patti gets published I will willingly, freely, and of my own volition will bake her a cake. Hold me to it. That's one beautiful cake, Kristy, and I'm jealous that you actually got Doreen to eat some. I offered to send her some homemade Scottish shortbread and she turned me down flat. As the Queen decreed, "Let Them Eat Cake!" Yum, now I am hungry. Patti - Yes, cake is the best part of the entire getting published thing. And we will be sure to hold Kristy to her word when your first book comes out. And, speaking of sue... Sue - thanks so much! I do plan to crash your party next time I'm in Naples. Jack - Ess, bubala, ess. This page contains a single entry from the blog posted on August 10, 2008 7:54 PM. The previous post in this blog was Vote For Miles!. The next post in this blog is Another Fabulous Book Group.